Doug Brown is the CEO of AquaVenture Holdings (NYSE: WAAS), a multinational provider of water purification solutions. TAMPA, Florida, Mar 21 2018 (IPS) - On World Water Day, March 22, universal access to clean water continues to be a privilege, when it should be a right. Experts predict that by 2030 the global water demand will exceed supply by 40%. Despite the fact that our oceans and seas make up more than 97% of the earth’s water resources and half the world’s population lives no further than 40 miles from the water, we’re experiencing one water crisis after another. Adding to that frustration is the fact that solutions exist today which could ameliorate our water issues. From the water shortage in Cape Town, South Africa — where the current supply is less than 90 days — to the well-documented issues in Flint, Michigan — where an outdated water delivery system delivered lead-tainted water to the city’s population — it is clear that steps must be taken to ensure an ongoing supply of clean water not only to drink, but to maintain the fabric of our society. We rely on clean water to produce food, electricity, cars, clothing and myriad other things that are difficult to live without. In fact, even if you exclude irrigation, less than five percent of purified water is used for consumption; most of the supply is used for washing, flushing and manufacturing. For centuries, people prayed for rain and collected it but that alone is no longer an option. There simply isn’t enough. What’s more, rain is unpredictable; it may or may not come. But with a limitless supply of water in the ocean, there is a viable option: desalination. Back in the 1700’s ocean going ships had their own desalination plants in order for them to have a continuous fresh water supply while at sea. In the early days, seawater was boiled and then condensed. The condensate had little to no salt and the remaining brine was then disposed. In the 1960’s technical advances in reverse osmosis made this form of water purification more widely available. Today, more than 18,000 desalination plants operate in over 150 countries, and the process requires 80 percent less energy than it did 20 years ago. According to the International Water Association, the energy required to produce a year’s worth of fresh water from sea water for one household is less than that consumed by the family’s refrigerator. We must also look at delivery systems. As was evidenced in Flint, much of our underground piping systems are in disrepair and can produce contamination from lead and other toxins. , Disinfectants are used to control biological growth but they can pose an increased risk of cancer and create bad tasting water. While conventional wisdom would say we need to fix the crumbling infrastructure, there is another option: point-of-use (POU) purification. Since typically only 5% of the water in a distribution system is actually used for drinking water, it is far more efficient to use POU filtration to purify that water at the point it is being consumed. Additionally, POU filtration is much more environmentally friendly than delivering purified water – from the plastics used in 5-gallon jugs to the greenhouse gasses emitted by the delivery trucks — point of use eliminates those issues and purifies only what is needed, when it is needed. Finally, we must still stress conservation and using existing water supplies more thoughtfully and efficiently. However, conservation and reuse alone will not avoid water crises around the world. Desalination and point of use systems must supplement conservation. With the technology available to us today, there shouldn’t ever be a water shortage, particularly when private industry can work in partnership with local, state and federal governments to help supply clean drinking water. As an example, the mining industry is a key economic driver in South America and it is heavily reliant on clean water to operate its mines. Population and industrial growth have put major strains on the natural supply of clean water, leading to a scarcity that has pitted industry, government and citizenry against each other. In one example in Chile, rather than putting more pressure on the already limited supply, the Caserones mining company opted to not only supply desalinated seawater to its mine but also provide desalinated drinking water to the local population in Caldera thereby creating a crucial resource for the community. 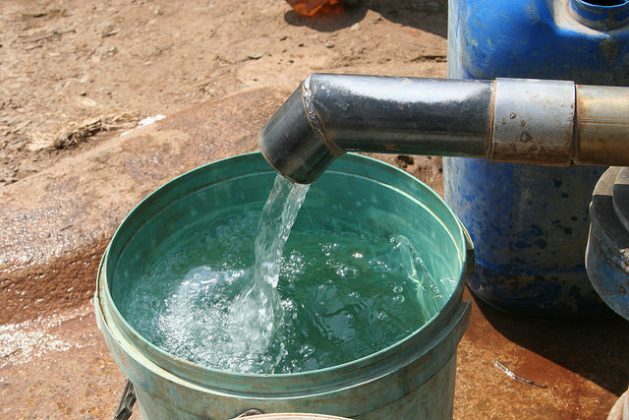 As a society – our objective should be that every human has access to clean drinking water. It is no longer sustainable – from an environmental, social or civic perspective – for private industry to rely solely on municipalities for their water needs. The diversification of our water supplies is required to bring the unlimited water in our oceans and seas to our tables and businesses, and guarantee fresh water for all. Like solar energy which is bountiful, water crisis could be easily solved if we have the will to over come the hurdles on land. Most of the countries have a long sea cost and it will be logical to garner this water sources to our advantage. Instead of planning huge projects coasting millions of dollars, it will be simple to install small desalination units along the cost and supply to all nearby villages for drinking water.. Use the river water which has becoming scarce now, for agricultural purposes. We are talking of linking rivers for so may years without any concrete plans, instead the government will do good if they seriously considering installation of desalination plats all over the country. The government must have the will to implement it.